Sold by Miran USA and Fulfilled by Amazon. Gift-wrap available. 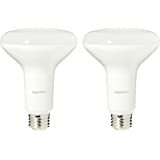 Save an extra $10.00 when you apply this coupon. 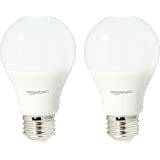 $10.00 extra savings coupon applied at checkout. PREMIUM MATERIALS: Miran Only Sources the Best Materials for all of Their Products. 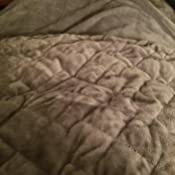 Hard Wearing Cotton and The Softest Minky (As Soft As Cashmere), make the most Luxurious Weighted Blanket on the Market. 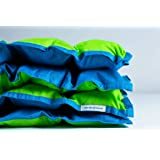 The Removable Cover Allows for Easy Care (Machine Washable) and The Most Snuggly Experience! 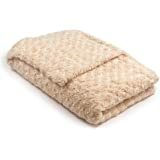 Quartz Glass Beads fill the weighted layer for give the Thinnest Weighted Blanket on the Market! 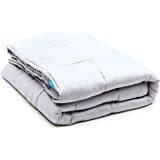 CHOOSING YOUR WEIGHT: Research Shows that a Weighted Blanket Should be AT LEAST 10% BODY WEIGHT | 100-150lb = 15lb Weight Blanket | 150-200lbs = 20lb Weighted Blanket | 200lb+ 25lb Weighted Blanket | If You Have Any Questions Please Contact Us! 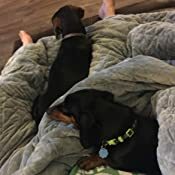 CHOOSING YOUR SIZE: Miran Understands That A Weighted Blanket Should Not Slip Off While Your Sleep - Every Blanket is a Large 60” by 80” which is Good For Anyone From 4’8” to 6’6 Tall! 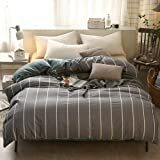 Fitting King, Queen, Full and Twin Size beds. 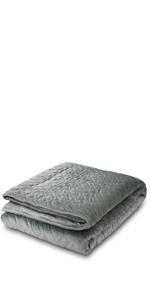 2 YEAR WARRANTY: Miran Stands by Their Products and is the Only Weight Blanket Company to Offer a Full 2-Year Warranty! Surveys show that 8 in 10 Americans have trouble falling asleep at least one night a week. 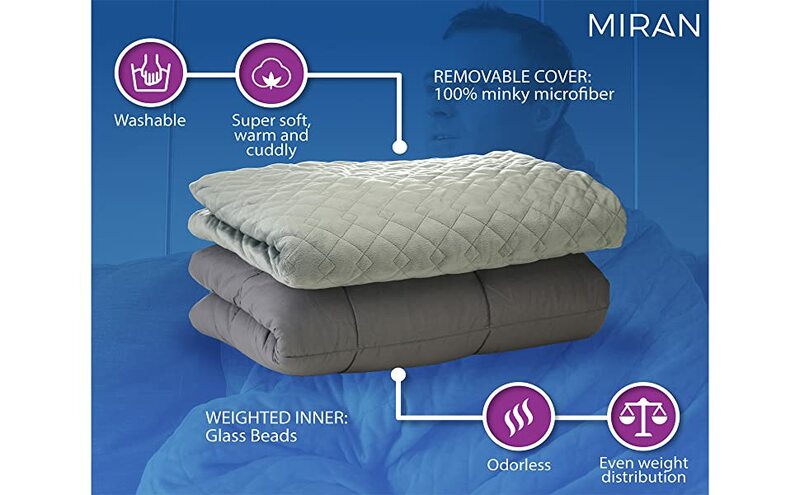 That's why we designed the Miran Blanket: a premium weighted blanket! 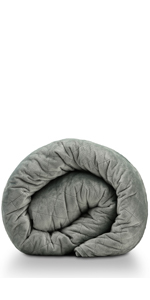 Our weighted blanket is the perfect solution for your busy lifestyle. 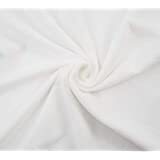 Each blanket comes with our signature soft, premium minky cover - designed with your comfort in mind. 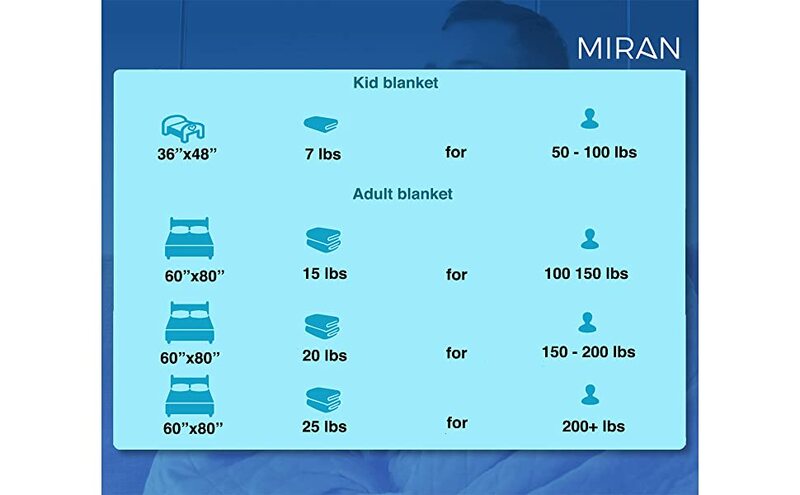 Miran Blanket measures 60" x 80" and is available in three weight options: 15, 20, and 25 pounds. 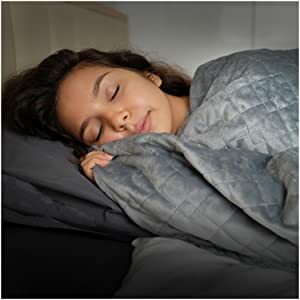 For best results, we recommend picking a weighted blanket that is equivalent to at least 10% of your body weight. 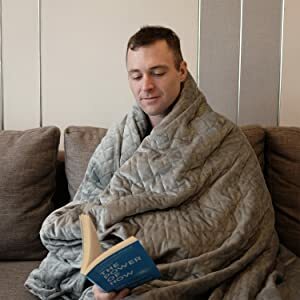 This blanket seems to be well made and the cover that it comes with is down right cozy. It’s the perfect size to fit half a king bed (my husband doesn’t share my affinity for weighted blankets). The inner blanket stays in place with the tie downs - I don’t understand the reviewers that say it shifts around. The only thing you should really know is that the cover is quite warm. It’s just starting to get into the 70’s for the year and I’m dying of heat stroke under this blanket. Which will be great in the winter but I plan to purchase an alternate cover for summer months. 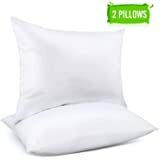 5.0 out of 5 starsI can sleep better now! When I picked up the box I was surprised at how heavy it was. 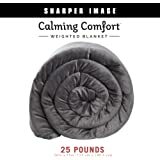 I ordered the 20 lb blanket for weights between 150 to 200 lbs. It was shipped a box in a box so very secure. Since I suffer from insomnia I wanted to give it a try. I have a queen size bed and covers most of the top of the bed. You'll have a few inches left on all sides. They don't want it hanging over the bed since it could fall off. 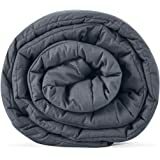 Pleasantly surprised at the comfort you feel with a weighted blanket. I actually want to go to bed earlier now! 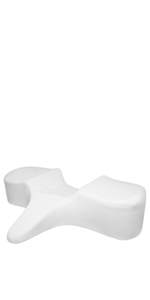 Gives me a comforting feeling and I am falling asleep faster since using it. 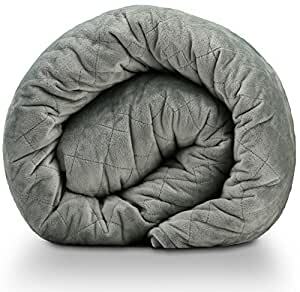 I would definitely recommend this to anyone suffering from anxiety, insomnia or just for that secure feeling. Not overwhelming at all. I also suffer from hot flashes but the weight hasn't affected that at all. My only wish is that they would offer it in more colors. 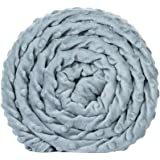 5 stars for this blanket! I don't know if it helps me sleep but it sure is comfy! My boyfriend and I have pretty bad anxiety and sleep restlessly, he hasn't noticed a difference but I feel like I fall asleep quicker. It's very soft. I would recommend getting a very heavy one since 25lbs spread out is still pretty light. Every now and then the beads shift but we just move it around and it goes back into place. 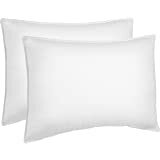 We got the largest size and it works pretty well for the both of us in a king sized bed (we sleep close together). I wish the blanket was a little bigger, it came slightly smaller than the advertised size, but I still like it! 3.0 out of 5 starsKids, no. Toddler, yes. This blanket is way smaller than I was thinking it would be. I know it's for kids and all, but it is tiny toddler small. It has now become a couch blanket. It works well as a couch blanket. It's just not for what I would consider a child. 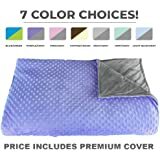 I ended up getting my son (he's 8 and on the smaller size) the 15 pound blanket. It works well for him. I would give it 5 stars if it was advertised as a toddler or couch blanket. Or, they could just stretch it out more to an actual twin size. At first I thought it would be too warm but was not a problem. I am sleeping sounder which is amazing. I am dreaming more and I never dream. Could this be stree release? 4.0 out of 5 starsThere aren't ties on the zipper side to hold the inside blanket in place. Overall this blanket is wonderful. I sleep better and I'm way more warm then I used to be. 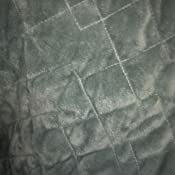 The only complain I have is that on the zipper side of the blanket there are no ties to hold the inside blanket in place. It doesn't move around very much but if you pick it up and move it it slides around a bit. But other then that I am very satisfied with the over all product. 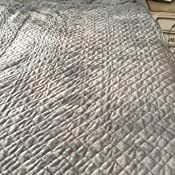 5.0 out of 5 starsAMAZING BLANKET!!! This might possibly be the best thing that I have EVER bought. 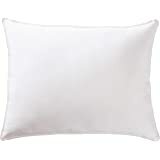 It is so soft and comfortable and it truly makes me sleep better!!! I really could not be happier. I own so many blankets and this is by far my favorite. I have a lot of anxiety and PTSD and have not slept well in months. After receiving this blanket I have slept so much better and I don't toss and turn and wake up as much. Thank you!! !